"Piano Man" is Billy Joel's signature song. It was his first major hit and instantly established him as a talented singer and songwriter. By now, many people know the story behind the song. 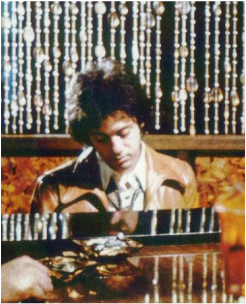 After his bad deal with Family Productions, Billy hid out from the music industry, writing songs and making a living playing piano at The Executive Room, a piano bar on Wilshire Boulevard in Los Angeles. Billy was billed as "Bill Martin" (Martin is his middle name). Click on the photo for an interesting look at the now defunct Executive Room, by Bob Egan. Many of the bar's customers were down on their luck, such as John the bartender who aspires to be an actor, Paul the "real estate novelist" (i.e., a guy who wants to write the Great American novel, but works as a real estate agent), and Davy, who will probably stay in the Navy for life. The waitress "practicing politics" refers to Billy's wife who was a cocktail waitress at the same bar. They come to the bar to commiserate with each other, to share a drink rather than drink alone. The piano man, Billy, lifts their spirits with song. But the patrons recognize that Billy is gifted, and question why someone as talented as he is stuck in a place like this, "man, what are you doing here?" It's a question he probably also asked himself, and one we all ask ourselves at some point in our lives. Musically, the song is relatively simple, in C major with a descending bass line and in 3/4 time. It is actually a waltz. The intro is a short jazzy riff, sounding like someone casually playing on the piano, and then the song's distinctive harmonica comes in, an obvious nod to Bob Dylan. The piano is the main instrument of course but is nicely accented by a mandolin. 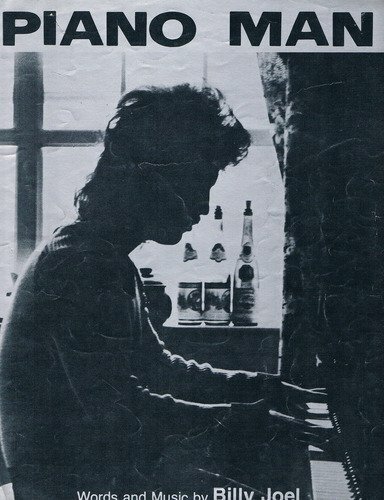 Lyrically, "Piano Man" contains some of Billy's most clever lines such as "making love to his tonic and gin," "Paul is a real estate novelist" and "they're sharing a drink called loneliness, but it's better than drinking alone." Billy paints a vivid scene of the bar and its patrons. Many compared "Piano Man" to Harry Chapin's story songs "Taxi" and "Cat's Cradle," a comparison that was apt but also too limiting to describe Billy Joel generally. The sheet music for "Piano Man"
Despite the melancholy of the song, it is not all depressing. The piano music brings the bar patrons a momentary respite from the drudgery of their lives. Beyond the literal meaning of the song, it is easy to find a broader meaning. The song can be seen as an allegorical description of the human condition and the role that art plays in it. We are all essentially alone, we cling to each other for company, each one of us pursuing our own dreams but ultimately settling for much less. We try to find comfort in a drink, a tonic and gin, but it is art and music that gives us real hope and relief from this condition. And that's precisely what Billy's music has provided to so many fans over the years. Perhaps this is why this simple song about a piano bar is so popular (it is the most downloaded Billy Joel song on iTunes), it speaks universally about the human condition and our need to be with each other, and our need for art and inspiration to uplift our lives. "Sing us the song you're the piano man, sing us a song tonight. Well we're all in the mood for a melody, and you've got us feeling alright." In this 1980 profile of Billy Joel on ABC's 20/20 program, Tom Hovland and Billy Joel discuss the origin of "Piano Man." 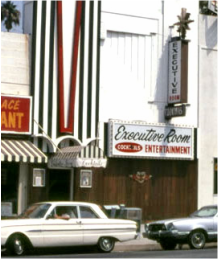 Hovland goes to the Los Angeles bar where Billy played in the early 1970s, The Executive Room, and interview patrons who remember Billy. Billy performs "Piano Man" on Don Kirshner's Rock Concert in 1973. He also sang "Captain Jack" and "Somewhere Along The Line." See more videos at Piano Man - Videos Page.